Grab a seat at the chef’s table. Hi, I’m Mareya otherwise known as The Fit Foodie. I’m a chef, holistic nutritionist, author, inventor and mom. And I want to welcome you to my podcast. 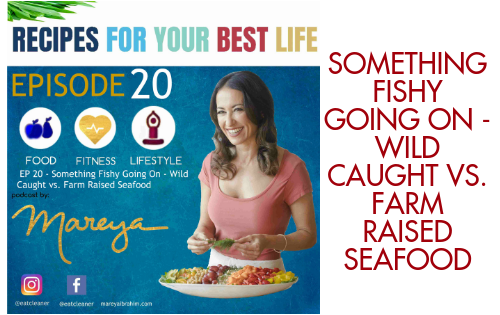 It’s called Recipes for Your Best Life and with every episode, I’m peeling back the onion on fitness, nutrition, health, wellness and family. The truth is, you’re the chef of your life, and for every important pillar, there’s a great recipe worth sharing. So every week, we’ll explore them together. Think of it as food for thought you can really sink your teeth into. So, join me, and let’s squeeze the joy out of this life! Can I get a Fork Yeah? Are you tired of diets and food labels? My new book ‘Eat Like You Give a Fork’ will transform how you think about health, wellness and living a fabulously fit life. 8 core strategies that you can eat and repeat, easy-to-prepare, chef-driven recipes and a tastebud reset that will change what you crave. Pre-order it today and get my free 8-week program! Remake your kitchen, your taste buds, your body, and your energy level with honest, transparent and easy-to-understand recipes. Core meal planning and preparation techniques from Ibrahim’s Facebook Live show save time, money and sanity. These forking delicious recipes make healthy eating simple and quick to table. I’m so glad we found each other. I’m a mom of 2 teenagers, raised them solo since they were babies so, I’ve learned how to not sweat the small stuff. I do sweat olive oil and can’t get enough avocados and arugula. I shoot a compound bow, left-handed. I get off on punching and kicking bags as often as I can and call myself a bendaholic because I can’t get enough vinyasa yoga. Travel is my love language. Butterflies make me ecstatic.